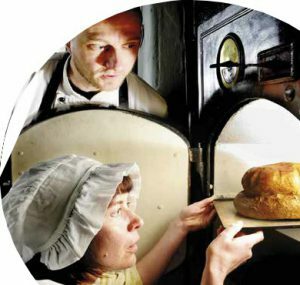 Edinburgh may be internationally renowned as a grand European capital with a rich heritage of Scottish history, but if you want to savour a different flavour of this World Heritage site, then grab a map of the Edinburgh Food Heritage Trail, created by the Edinburgh World Heritage charity. The city is an architectural gem whose history is etched into the 1,600 listed buildings across the city. However, if you explore the nooks and crannies of the medieval Old Town or visit the elegant and spacious Georgian houses of the New Town, there is another fascinating story to explore, where food and feasting has influenced the city’s development and culture. Edinburgh Castle is a good place to start the Food Trail. In the cavernous medieval Great Hall, you can appreciate what it was like to enjoy a state banquet, where tresselled tables would groan under the huge range of courses dished up to impress honoured guests by the kings of Scotland. However, not all of these banquets were so convivial. Visit David’s Tower in the older part of the Castle and you will find yourself at the site of the infamous Black Dinner. The entrance of a black bull’s head on a platter was the signal for an assassin to murder the Earl of Douglas in front of the young King James II and his court in 1440 – an event that later provided an idea for George R. R. Martin for his Game of Thrones novels. The theme of banquets continues with a visit to Parliament Hall, an architectural gem hidden behind St Giles’ Cathedral. Its Great Hall, with its famous hammerbeam roof of black oak, hosted the city’s greatest-ever gourmet event: the Lord Provost’s banquet to celebrate the visit of King George IV to Edinburgh in 1822. More than 300 dignitaries sat down toan eight-course meal on gold and silver plates featuring such delicacies as turtle soup, stewed carp, venison, grouse, quail, sheep’s head and haggis. In medieval times, people rarely entertained at home because, unless they were very wealthy, kitchen and dining space was limited – as can be seen in the 17th- century Gladstone’s Land merchant house. That’s why inns and taverns proliferated across the city, providing venues where people would meet to celebrate occasions in private rooms or among the ‘hoi polloi’. There was plenty of food available as the streets in the Old Town were basically a collection of interlinking markets, their names today still giving a clue to their former use: Grassmarket, where the cattle were brought into the city, and Fleshmarket, where they were butchered. This tradition of street markets is preserved today with the Edinburgh Farmers’ Market, which nestles in the shadow of the castle, offering fresh local produce from more than 50 specialist producers. Located on the Firth of Forth, Edinburgh has always been a port town and seafood has played an important role in feeding its citizens. In the north, beyond Leith, is Newhaven Harbour, which was once home to a thriving fishing community – the ‘fishwives’ were a common site around the city shouting out their wares, with wicker creels full of the day’s catch on their backs. Although oysters are a luxury dish today, in centuries past they were an important staple for the poor. Thanks to the once-plentiful shell beds in the Firth of Forth, it is estimated that 100,000 oysters were eaten each day in Edinburgh. Such was their popularity that ‘oyster cellars’ became a cheap form of entertainment around the city, where people joined together in basement parties to enjoy fresh shellfish washed down with porter and punch… and some ‘wild dancing’. 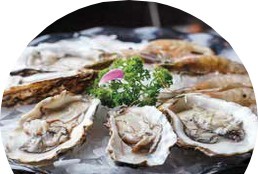 Although the Edinburgh shell beds were exhausted by Victorian times, today you can enjoy fresh Scottish oysters at numerous restaurants around the city, such as Ondine, which specialises in fresh local seafood. Oysters have also left their mark on the city as a construction material, as broken shell can be found in the grouting and cement in medieval walls. Occasionally, construction workers extending underground premises will come across piles of discarded shells – no doubt the debris from the infamous ‘oyster cellars’. With all this great produce on its doorstep, it’s not surprising to find out that Edinburgh was a great place to be a chef… but did you know the city also taught the world to cook? It started in the 1750s, when Elizabeth Cleland set up a cookery school in her home near St Giles’ Cathedral – and this started a trend as the burgeoning middle classes encouraged their daughters to develop skills to help them become more marriageable. Susanna MacIver is another of these female entrepreneurs who brought out a cookbook in 1774 called Cookery and Pastry, which included the first printed Scottish recipe for haggis. Another pioneer was Florence Jack, who ran a cookery school and published the Good Housekeeping Cookery Book in 1925, which is still regarded by many as the ultimate cook’s bible. The tradition continues today with the New Town Cookery School, run by Fiona Burrell, co-author of Leith’s Baking Bible. 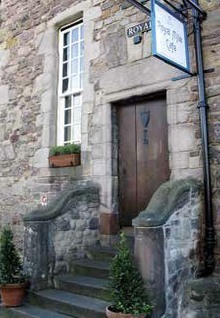 A visit to The Georgian House in the New Town will give you an idea of how cooking and entertaining was important to the new middle class of Edinburgh. Large kitchens and dining areas were incorporated into houses in this period and heralded the arrival of grand private dining, where elaborate dishes could be served up in grand style to many guests in the comfort of the home. These are just a few of the fascinating highlights on the 21-site tour, which also takes in the National Library of Scotland, the Palace of Holyrood, Queen Mary’s Bath House, hidden gardens and historic townhouses that now host exciting restaurants throughout the city. So download the Edinburgh Food Trail for a tasty menu of locations that lets you experience the city’s culinary traditions and dine in some of its historic locations: it’s Edinburgh on a plate, with a side order of history.